Who was Eva Duarte de Perón? Eva Maria Duarte was born out of wedlock to a wealthy planter in rural Argentina in 1919. Her father already had a wife and family while he continued a relationship with her mother, Juana Ibaguren. It was not uncommon for wealthy men in male dominated Argentine society to have several families. The children from such an arrangment were considered a lower class before the law. This was a past which Eva tried to erase, but which she could not escape in her climb to the top. From this humble beginning, Eva went on to become a model, actress, radio star and finally the first lady of Argentina. She rose to be the most powerful woman in a country whose culture was heavily male-dominated, and was nominated for the vice-presidency. She founded organizations to help the poor and working classes, championed women's rights and was largely believed to be the force which kept her husband in power. Below you will find links you can use in gathering background information on Evita. You may work in groups of two to answer the biography questions on your worksheet. It is recommended you divide the questions up among yourselves in orders to look up the answers. The worksheet will be due at the end of the class period. You may turn in one worksheet for all group members. Please remember to include all your names on the worksheet so everyone involved can receive full credit. 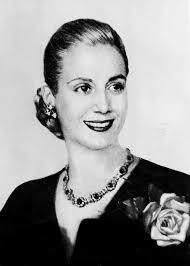 Evita: The Legacy of Eva Perón - Focus on the section "Eva Peron's "Star Quality"